Why not meet or entertain in a refreshing, invigorating way? We offer a wonderful, rural hideaway. A location where no one will disturb or distract you. Somewhere you can totally relax, yet do something challenging and perhaps a little different yet focus on your business objectives, with exclusive use of our venue. Coopers Country is where you can formulate a better plan, revitalise your team, entertain your customers or simply thank or reward your staff. Our clay-shooting packages are delivered in an interesting informative and fun way. For some it is an opportunity to try something new; for others the chance to improve in a meaningful manner. 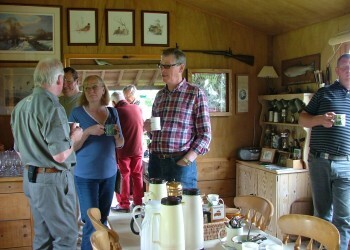 Meeting facilities and refreshments are included in our Business Blast package price, as is tuition, use of shotguns, other equipment as required and 50 clays and cartridges each. Duration: 2 hours. Additionally lunch, afternoon tea or dinner can be arranged at our Sporting Lodge. Quotations available for larger groups as are and tailored arrangements. Additionally, we work with a number of hotels near Ipswich and Bury St. Edmunds and we can be booked in conjunction with a Conference, either at a hotel or here as an ad-on arrangement. Please ask the Conference Organiser co-ordinating your arrangements. Please telephone Julie Wilkinson on 01449 760493 to discuss your requirements.